Photo courtesy of Anwar Shaikh. On a wintery day in late November, Anwar Shaikh found himself at an elegant banquet overlooking the beach in Pescara, Italy with a silver medal dangling from his neck. 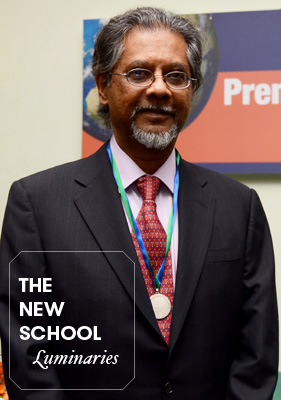 The New School for Social Research economist had just received the 2013 Social Science Prize, an award from the NordSud International Prize for Literature and Science. A part of the Fondazione Pescarabruzzo, the prize was established in 2009 to create a scholars’ “hall of fame” that encourages dialogue between the cultures and economies of the global north and the global south. The foundation chose Shaikh for the award based on his work modeling Hungarian-born businessman George Soro’s idea of reflexivity. The paper, entitled “Reflexivity, Path-Dependence and Disequilibrium Dynamics,” was published in the Journal of Post Keynesian Economics in the fall of 2010, and formally predicted how expectations affect actual outcomes in economics and beyond. By formalizing a system of equations for Soros’ concept (which the businessman used to predict stock market performance), Shaikh created a theoretical foundation for when economies “fall down,” or face periods of recession. While in Pescara, Shaikh gave a short presentation before the award committee and guests, while also lecturing at the Università degli Studi ‘G. d’Annunzio’ Chieti e Pescara on his most recent work, which looks at the relationship between wages and unemployment in the United States. Read more about Shaikh’s work here.